We recommend checking out our discussion threads on the Aquabotix HydroView PRO SLE Mini Underwater ROV 01-HV-PRO-000SLE, which address similar problems with connecting and setting up ROVs Aquabotix. The user manual for the Aquabotix HydroView PRO SLE Mini Underwater ROV 01-HV-PRO-000SLE provides necessary instructions for the proper use of the product Photography - Underwater Photography - ROVs. 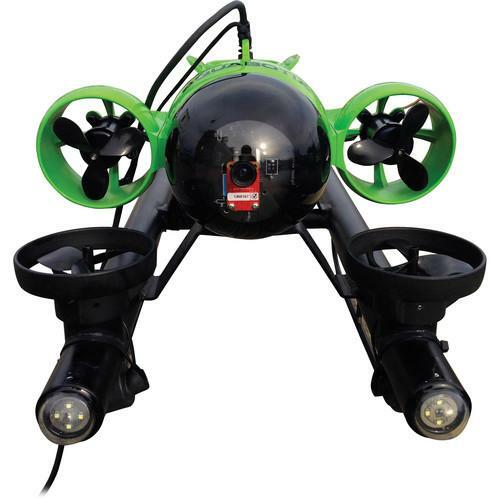 A highly useful tool for underwater exploration, the lime green and black HydroView PRO SLE Mini Underwater ROV with Live Video from Aquabotix allows you to study marine life and environments at a maximum depth of 330'. It can also be employed to check water depths, water tanks, and the undersides of boats, or to carry out search-and-recovery missions. The ROV provides a live video feed to the surface and captures videos and photos. This version is configured specifically for security and law enforcement. It is the same as the HydroView PRO 7M except for several notable upgrades. Its camera improves on the 7M's with tilt capability, continuous focus, and 1080p Full HD video, which can be recorded for up to 17 hr thanks to the 128GB of solid-state memory. The ROV also includes a longer tethering cable, a wireless hand controller, and much brighter 700-lumen LED pontoon lighting. The PRO SLE has a wide-angle lens offering a 66° angle of view, and the dome port counteracts the decrease in coverage that occurs underwater by providing a wider angle. A 328' chemical-resistant Cat 5e cable allows for connection to the included topside box, which generates its own Wi-Fi for connecting your iPad or PC via the free downloadable app. Mac operating systems are not compatible. The box has a LAN connection enabling the use of an optional Ethernet cable as an alternative to Wi-Fi. The app lets you view the vehicle's live video feed on your computer's display and remotely control its movements and functions. For greater operating range up to 500', optional Cat 5e cable extensions are available. This version of the HydroView PRO features 7 Swiss-made, high torque motors, including 4 thrusters and 3 hovering/pitch motors, with propellers and propeller guards. The unique motor configuration gives you complete control over forward/backward and up/down motions, as well as roll, pitch, yaw, and hovering. The HydroView can reach speeds up to 4 knots going forward and 2 knots in reverse. It runs on 2 rechargeable lithium-ion batteries. Two alternate versions of the HydroView are available separately: one configured with 12/24VDC topside continuous power and one configured with 110-240VAC topside continuous power. The orientation sensor provides you with readings on yaw, pitch, roll, and heading relative to true north. This sensor aids in navigation of the vehicle and is extremely useful in poor water quality conditions. There's also a depth sensor that gives you readings on the underwater depth of the vehicle, allowing you to drive it to the exact depth needed for your purposes. This is also a useful tool when you find something underwater that you want to be able to locate again. The HydroView also features a sensor that detects and indicates the temperature of the water where the vehicle is swimming. The HydroView software provides control over heading, pitch, depth, thrust, waypoints, and patterns. If you own a Aquabotix rovs and have a user manual in electronic form, you can upload it to this website using the link on the right side of the screen. The user manual for the Aquabotix HydroView PRO SLE Mini Underwater ROV 01-HV-PRO-000SLE can be downloaded in .pdf format if it did not come with your new rovs, although the seller is required to supply one. It is also quite common that customers throw out the user manual with the box, or put the CD away somewhere and then can’t find it. That’s why we and other Aquabotix users keep a unique electronic library for Aquabotix rovss, where you can use our link to download the user manual for the Aquabotix HydroView PRO SLE Mini Underwater ROV 01-HV-PRO-000SLE. The user manual lists all of the functions of the Aquabotix HydroView PRO SLE Mini Underwater ROV 01-HV-PRO-000SLE, all the basic and advanced features and tells you how to use the rovs. The manual also provides troubleshooting for common problems. Even greater detail is provided by the service manual, which is not typically shipped with the product, but which can often be downloaded from Aquabotix service. If you want to help expand our database, you can upload a link to this website to download a user manual or service manual, ideally in .pdf format. These pages are created by you – users of the Aquabotix HydroView PRO SLE Mini Underwater ROV 01-HV-PRO-000SLE. User manuals are also available on the Aquabotix website under Photography - Underwater Photography - ROVs.